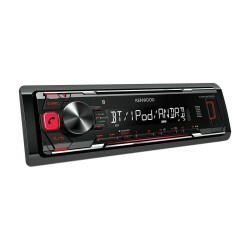 Kenwood KMM-BT302 Mechless Car Stereo with Bluetooth, USB,iPod direct & AUX In. No CD, no problem. 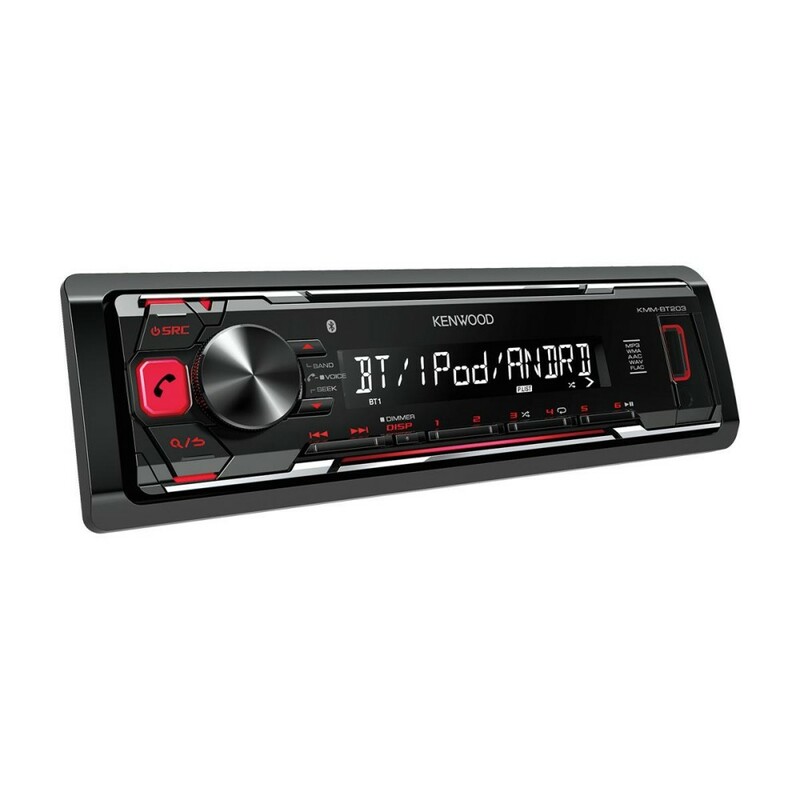 With bluetooth, USB and aux in you'll have no trouble playing your music through the Kenwood KMM-BT302. With the ability to playback compressed music files or FLAC high quality files via its front mounted USB input. iPod/iPhone users can also access and control their music library. On the Bluetooth front your phonebook list is displayed for selection and previous call logs can also be used. In coming caller number or name is also displayed before you allow connection. A second phone can also be connected for call/send/receive only. A high power 4x50watt built-in power amplifier will fill your car with high quality sound from any source. I found this item very frustrating to use. The buttons are small and fiddly, especially the source button and channel buttons which I use often. Station tuning was difficult, I ended up to doing this manually. The facia feels of cheap plastic and it uses bright red LEDs which are not dimmed by the dimmer function. Once the stations were tuned, the sound was OK, Bluetooth worked well, as did the traffic information. I couldn't find a way to use the radio with Bluetooth navigation, but this is probably typical at this price point. Although all the radios at this price point look almost identical, manufacturers have programmed their products differently, and some other similar products don't suffer from the issues I found on this radio. What fitting equipment would I need to buy? Please see the link provided for installation parts required to install this Kenwood unit into your Grande Punto. HI Will this fit in my bmw e46 2002 5 door 330d. It has steering controls. I want to install this in my Ceat Ibiza 2005 will it fit ? does this comes with all cables and connectors etc. The Kenwood KMM-BT302 can be installed in your Seat Ibiza. You will need the following parts fro installation. Thanks for your question, we have checked for you & the KMM-BT302 can be fitted into your Corolla, with some fitting parts required, we would need to know if your car has steering wheel controls to assess which parts are required & we would need to check the cables behind the radio to ensure the correct cables are ordered, as there are variations. You would be looking at around �75.00 for parts & �60 for fitting. What parts would I need to fit this radio to my 51 plate Xsara ? Please see below for the suggested parts. Will this fit in my Car? 2005 120d BMW. The KMM-BT302 can be installed in your Vauxhall Astra. You will need the following parts for installation. Note: The car is an R50, 2003 Mini. Is this unit mechanically installed using 4 screws, screwed in from the front i.e. standard mini installation. For installation you will need the below listed fascia plate which is screwed down using 4 screws. then the cage is locked into the fascia. you will need the below listed parts to retain the steering controls. Hope this helps if not contact your local store. Hi we actually have a Cheverolet Matiz 2008. Would I be able to fit this in my car as it only an ISO connector and the aerial plug on it's present stereo. I guess I would need some kind of adapter. To fit the KMM-Bt302 to your integra you will need a wiring harness adapter. KMM-BT302 Mechless Car Stereo with Bluetooth USBiPod direct & AUX In. Hi. What would I need to fit this in a 2007 Ford Focus Zetec, and to work with the steering controls? Thanks! You can stream music to the Kenwood KMM-BT302. You will need the below listed parts for installation. Please see the list of parts needed for your vehicle. Hi, does this come with a remote microphone for phone calls? yes it comes with microphone in the box for the bluethooth .